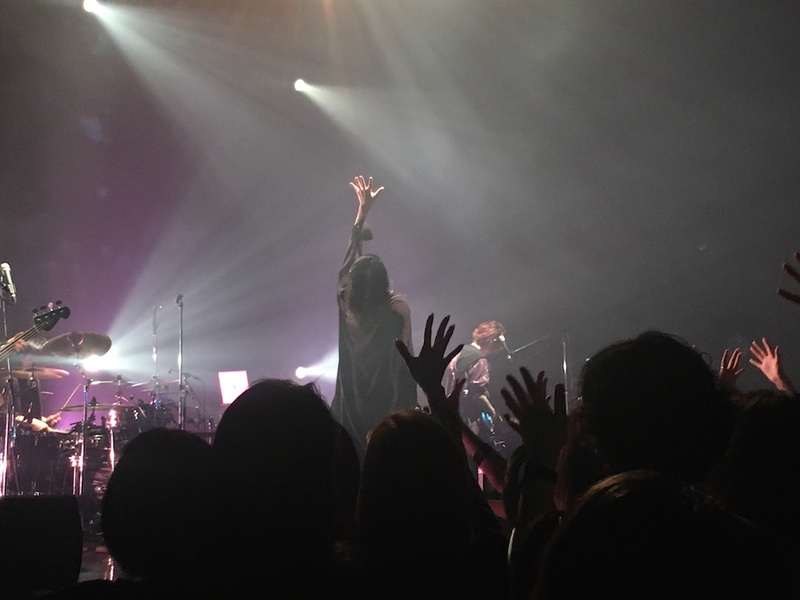 Plastic Tree hit Osaka on March 18th with the release of doorAdore barely a week and a half behind them. How proud the band is of this new album is absolutely unmistakable – new tracks made up more than three-quarters of the set list that night. Opening up the show with “engoku” set the mood perfectly. The song was featured in a dreamy music video released in February. 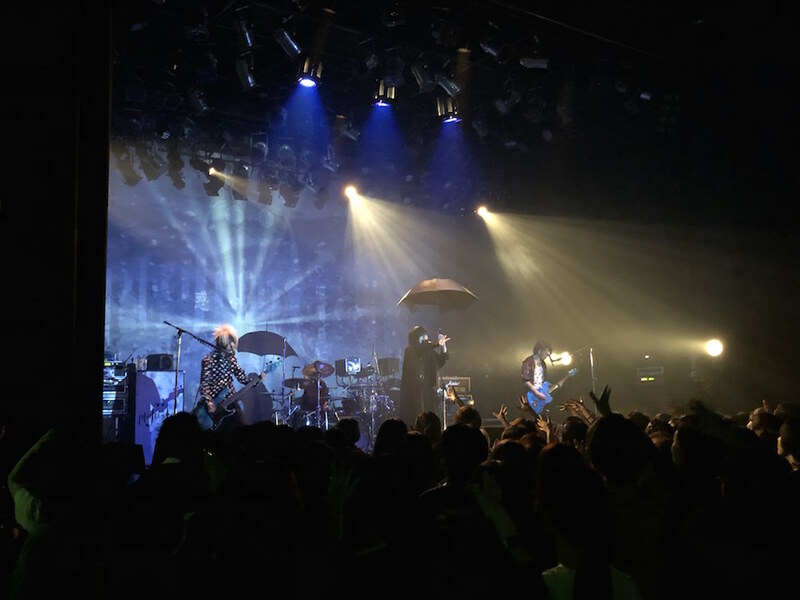 Plastic Tree has been part of the visual kei scene for over 20 years. Managing to make new music that strikes a balance between being fresh and echoing an act’s signature sound is a skill you would expect any band with that kind of pedigree to have mastered, and they’re no exception. Some excellent examples of this are “zanei”, a solid ballad, and “irotsuki”, an infectiously boppy tune that really got the house dancing. “SEARCH AND DESTROY”, a song reminiscent of early 90s poprock, had a theatrical flair that still felt earnest. Vocalist Ryutaro grabbed a large notebook and seemed to sing the morose lyrics directly from it. He sat at the edge of the stage, then on a stool, then began walking in anxious circles in constant, subtly arresting motion. “nenriki” showed even more evolution in their sound. Its a great quasi-EDM track, and the whole audience brought out cute blue-toned light wands to shake to the beat. Plastic Tree is known for their shoegaze-inspired past, but songs like this and the 80s synth-inspired “UTOPIA BERRY BLUE” are perfect for getting a whole venue full of people jumping. That isn’t to say the band can’t rock out. Ryutaro broke out a bright red megaphone for “scenario”. It the first headbanger of the night, and a good one. The next few songs cooled things off including the always-stunning “Harusaki Sentimental” as the first encore of the night. A huge part of the appeal of a Plastic Tree show lies in the charisma of the members and the way they bounce off of each other onstage. Not just midperformance, where they don’t hesitate to give each other hell for making mistakes – as was the case that night during the second encore when Ryutaro forgot the lyrics to the second verse, prompting guitarist Akira to playfully give him crap for it. But it’s also during the multitude of MC breaks where they banter about topics ranging from how many people in the audience admitted to not having listened to the new album yet (about 75%), to how the drummer Kenken got drunk by accident the day prior when they were all boozing onstage. Seemingly inspired by Kenken’s antics, Ryutaro demonstrated a potential use for the black mug on sale by pouring beer into it, thereafter admitting that he would honestly probably just use it to gargle (a common practice during cold and flu season in Japan). That didn’t stop him from adding even more beer to the mug to drink before the final two songs of the night. Don’t sleep on doorAdore, or the upcoming shows the band has this July in Tokyo if you can manage it. They’re an absolute blast and you may find yourself buying a new black mug for beer before you head home.